I think I want to like olives in my breads and scones more than I actually do. This misguided notion led me to believe I would love Tomato-Pesto with Kalamata Olive scones, but I think instead I just liked them. It’s not their fault. I also probably over-worked the dough. 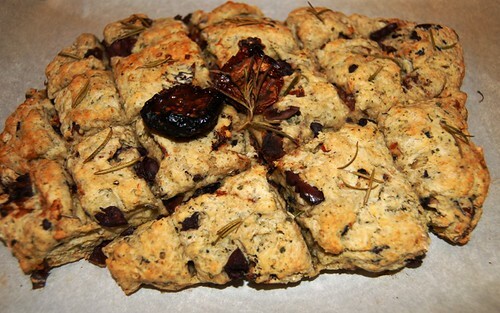 Despite my so-so feeling about the taste, I loved the aroma of the fresh rosemary in these scones, and it was fun re-hydrating the dried tomatoes. I thought they would be more red, but they stayed pretty dark. While I was getting up the ingredients for the scones at Whole Foods, I also picked up a jar of Tikka Masala simmer sauce, a ready-prepared portobella mushroom and pepper strips (4 colors!) 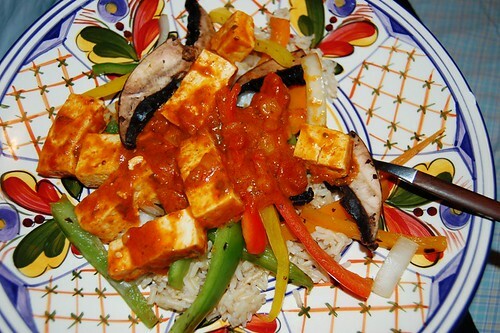 pack, a bag of brown basmati rice, and some extra firm tofu. Add to that an onion from home, and I was armed and ready for a big plate of delicious…and a few days worth of lunches, too! So now that we have talked shop a little…do you want to know more about the lucky good news I mentioned yesterday? I will be attending the 3rd annual Food Blogger Camp this January in Mexico! How awesome is it that I get to say I am going to CAMP? I never went to camp and I always had some serious camp envy (thank you Parent Trap and Babysitters Club). FBC is a 5-day extravaganza hosted by famed food bloggers and/or photography experts David Lebovitz, Elise Bauer (Simply Recipes), Matt Armendariz (MattBites), Jaden Hair (Steamy Kitchen), Adam Pearson, Diane Cu and Todd Porter (White on Rice Couple). This is an amazing roster. Each day there will be sessions on blogging, photography, branding skills, and more…not to mention a whole slew of amenities courtesy of the Grand Velas Riviera Maya resort! And of course, a lot of great food. I have been long overdue for a vacation and this will be that, but so much more. I have found such delight and satisfaction through working in my kitchen and on this blog for the past 6 months (largely due to interacting with you…I mean it) and I want to continue to grow and learn. And this is growing and learning from the best…with lots of sunblock! Pre-heat oven to 425 degrees and line a large baking sheet with parchment paper. 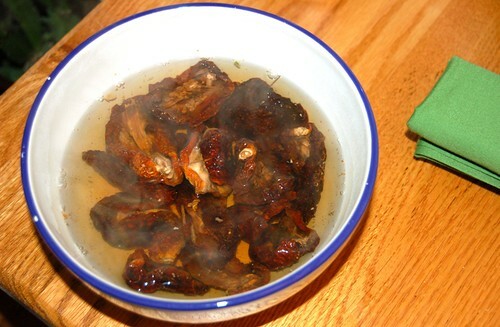 In a small bowl, place dried tomatoes and add enough boiling water to cover. Let stand for 10 minutes, then drain. Set aside 2 of the tomatoes, then chop the remaining amount and set aside. In a large bowl, combine flour, pesto mix, baking powder, and baking soda. Cut in cold butter using a pastry blender or 2 knives until mixture resembles coarse crumbs. In a medium bowl, combine milk and egg yolk. Add egg mixture to flour mixture all at once. Toss a few times, then add in chopped tomatoes, olives, and snipped rosemary. Toss with a fork until just combined. Turn dough out onto a lightly floured surface and knead by folding and gently pressing 10-12 times or until dough just holds together. With floured hands, pat dough into a 9×6 inch rectangle on prepared baking sheet. Using a sharp knife or bench press, cut scones into squares (do not separate). Lightly press reserved tomatoes and a few rosemary sprigs into top of dough. Brush with olive oil. Baking for 12-14 minutes or until lightly browned. Gently pull or cut scones to separate. Serve warm. Aimee: Congrats! This is really well-deserved. Reading your blog is a joy and feels like a way to stay in touch even though we are so far apart. Enjoy your holiday and the chance to rub elbows with the food blogerati. That’s awesome that you are going! The event this year looks outstanding…can’t wait to read all about it! Congrats! PS, these scones look incredible. Did you find it hard not to eat the whole thing? I probably would have.. Interesting idea, pesto scones – adding that to my list of recipes to try!